Lawrence Power, Britain’s acknowledged greatest living viola player, continues his fascinating and acclaimed series of Hindemith’s complete viola music. This second disc features Hindemith’s solo viola sonatas. These works were all written for Hindemith himself to perform, and are thus are of special significance—as near to a personal testament, an intimate soliloquy, as exists in his multifarious and genre-spanning output. The shadow of Bach lies over any composer writing a solo string sonata, and this is clear in the Passacaglia Op 11 No 5 Sonata, where Hindemith’s ultimate model is unmistakably the famous D minor Chaconne from Bach’s second violin partita—but viewed through a post-Brahmsian sense of sonority and architecture that produces a truly contemporary result. This ardent (and arduous) movement, a most impressive compositional feat, is the first example of a form which was to be one of Hindemith’s trademarks throughout his career, and it makes the Sonata something of a personal manifesto of artistic ambition. In later sonatas the severity of Hindemith’s mature style becomes evident—but harnessed, here, to the extraordinary virtuosity of the composer-performer, it gives rise to the most exhilarating and eloquent music. Paul Hindemith was a versatile instrumentalist. He once claimed he could play any of the wind, brass, string, percussion or keyboard parts in the varied ensembles of his Op 36 Kammermusik concertos. At the age of nineteen, already leader of the Frankfurt Opera Orchestra, he had publicly performed Beethoven’s Violin Concerto, and seemed destined to be a violinist. But the viola was his great love; in the 1920s he became internationally renowned as a virtuoso of the instrument—both as violist of the Amar String Quartet and as a concert soloist. (He gave the premiere of William Walton’s Viola Concerto, for example.) He probably wrote more solo repertoire for the viola than for any other instrument, and his works for his instrument are probably more numerous and significant than any other twentieth-century composer’s. In addition to a full-scale concerto (Der Schwanendreher), two other concerto-like works (the fifth Kammermusik and the second Konzertmusik), and the Trauermusik for viola and strings, he composed no fewer than seven sonatas, either for viola and piano (these are recorded on Hyperion CDA67721) or for viola unaccompanied. Hindemith wrote all these works for his own performance. Thus the four unaccompanied sonatas, which appeared over a period of nearly twenty years, are of special significance—as near to a personal testament, an intimate soliloquy, as exists in his multifarious and genre-spanning output. The unaccompanied string sonata is one of the most demanding instrumental forms: the player must project not just a single melody line, but create (or at least imply) self-sufficient harmony and counterpoint on the separate strings. The solo string sonata, as a genre, had in fact virtually fallen out of use since the Baroque era, in which the peerless masterpieces in this form are J S Bach’s Sonatas and Partitas for violin and Suites for cello. Just to attempt the solo sonata genre gave a Bachian cast to Hindemith’s musical thought. But by Hindemith’s time the viola had long been the Cinderella of the strings, seldom used as a soloist throughout the Classical and Romantic eras apart from eccentric exceptions such as Berlioz’s Harold in Italy. Hindemith’s championship of it as player and composer was part of a wider movement at the start of the twentieth century to enlarge the viola repertoire, paralleling the work of the virtuoso interpreter Lionel Tertis in Great Britain. It is also worth noting that Hindemith was among the first players to champion the unaccompanied Mystery Sonatas of Heinrich Biber, which pre-date those of Bach. But there is no doubt that, in his first attempts at the genre of unaccompanied sonata, Hindemith was thinking of the example of Max Reger, a palpable stylistic influence on some of his early music. It was Reger who, at the end of his life, in the first years of World War I, pioneered the adaptation of Bachian string-instrumental style to the expanded harmonic language of the early twentieth century. Reger’s vast Op 131 collection, which includes his second set of Preludes and Fugues for solo violin, three Suites for solo cello (recorded on Hyperion CDA67581/2) and, significantly, three Suites for solo viola, appeared in 1915, just four years before Hindemith produced his first sonata for solo viola in 1919. It is surely no coincidence that the first known performance of any of Reger’s cello suites was given in 1916 by Maurits Frank, who was the teacher of Hindemith’s cellist brother, Rudolf: in fact, Hindemith wrote his early Cello Concerto in E flat major Op 3 for Frank that same year. His first Sonata for unaccompanied viola Op 11 No 5 is the fifth of the five stringed-instrument sonatas which Hindemith began in 1918 while still serving in the German army on the Western Front, completed after his return home to Frankfurt in early 1919 and published together as his Opus 11. At that time it was an almost unheard-of gesture to group together so many works as subdivisions of a single opus, and it indicated Hindemith’s desire to put away Romantic attitudes, such as the idea that every composition was a complete and utterly separate work of art. Admittedly Brahms and Reger had sometimes published chamber works in pairs or threes, but by encompassing such a large number of fair-sized works Hindemith was going back to the examples of Haydn or even Handel, providing a collection from which performers might choose. He was quick off the mark in giving the first performance of the sister sonata (Op 11 No 4) for viola and piano, but he did not premiere the solo sonata, Op 11 No 5—perhaps inevitably the most taxing of them all—until 14 November 1920, in a recital in Friedburg, though it was sketched by 21 July 1919. Op 11 No 5 reflects something of the influences which were still helping Hindemith to shape his personal identity in music. Brahms, Reger and César Franck are hinted at in the ‘lively but not hurried’ (Lebhaft, aber nicht geeilt) first movement; there is a tincture of Debussy (beloved by Hindemith’s commanding officer at the front) in the rhapsodic slow movement. Hindemith instructed his new publishers, Schotts Söhne of Mainz, to set this movement’s central section in smaller type, as a kind of evanescent parenthesis. The succeeding scherzo, too, has a touch of Impressionist fantasy, reminding us of the ‘moonstruck Pierrot’ depicted in Debussy’s 1914 Cello Sonata. These three movements are all quite short, but the finale is a massive variation movement headed ‘In the Form and Tempo of a Passacaglia’ (In Form und Zeitmass einer Passacaglia). Hindemith’s ultimate model is unmistakably the famous D minor Chaconne from Bach’s Violin Partita BWV1004, but viewed through a post-Brahmsian sense of sonority and architecture that produces a truly contemporary result. This ardent (and arduous) movement, a most impressive compositional feat, is the first example of a form which was to be one of Hindemith’s trademarks throughout his career, and it makes the Sonata something of a personal manifesto of artistic ambition. Hindemith presented his next Sonata for unaccompanied viola Op 25 No 1 at a concert in Cologne on 18 March 1922. Since 1919 he had leapt to prominence as Germany’s leading young composer, passed swiftly through a stage as an Expressionist enfant terrible and emerged—with his Kammermusik series—as the leader of a neo-Baroque tendency, busily neoclassical, less concerned with beauty and eloquence than the efficient and vigorous presentation of pure musical ideas: the so-called ‘New Objectivity’ (Neue Sachlichkeit). This tendency is immediately apparent in Op 25 No 1, which opens with an introductory movement that juxtaposes an aggressive chordal sequence against material of a more pleading character and quickly passes into a ‘very fresh and taut’ (Sehr frisch und straff) quicker movement. Aesthetic relief is afforded by the two fairly substantial, and musically related, lyrical slow movements—especially the moving and elegiac one with which the sonata closes. But between them comes the fourth movement, a furious outburst that carries the extraordinary marking ‘Raging tempo. Wild. Beauty of tone is of a secondary consideration’ (Rasendes Zeitmass. Wild. Tonschönheit ist Nebensache). From the initial hornet buzz of a repeated low C, this movement consists entirely of single crochets played at breakneck speed but organized according to constantly changing time-signatures: a machine-age scherzo indeed. 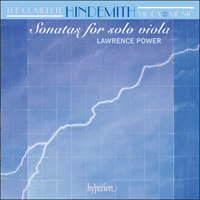 One year further on, Hindemith’s Sonata for unaccompanied viola Op 31 No 4, composed during 1923 but not performed until the following year, confirmed the severity of his new style, but already presages greater freedom. The first of the three movements is a remarkable test of virtuosity in the manner of a vigorous moto perpetuo, with flashes of wit and pounding, obsessive folk dance rhythms. The slow movement, headed ‘Lied’, is song-like: a gracious and intricate lyric interlude. Like Op 11 No 5, this sonata ends with a massive finale, lasting longer than the other movements combined. Here it is a set of variations on a rather rustic, even quasi-medieval theme propounded at the outset. The sequence of variations is divided into three large spans, at first increasingly virtuosic, then slow and inwardly expressive, and finally working up to an earnest and grandiloquent conclusion. Hindemith gave the premiere of this sonata in Donaueschingen on 18 May 1924. By April 1937, when Hindemith wrote his final Sonata for unaccompanied viola, he was virtually exiled from Germany by the Nazis and living the life of an itinerant composer-performer, though he had not quite taken the final decision to leave Germany for good: that would happen the following year. The sonata was dashed down on a train journey from New York to Chicago, and finished on 21 April, the day he premiered it at the Chicago Arts Club. By now his language had become more warmly emotional, even romantic again, and in contrast to the chromaticism of the two preceding sonatas there is an emphasis on bright intervals, notably the perfect fourth and fifth. Despite the anxious times in which it was composed, this sonata is in fact the most direct and lyrical of the series, and its three movements (with central hints of a fourth and fifth) provide the most balanced formal design. Nevertheless a virtuosity rooted in Hindemith’s profound knowledge of the instrument is everywhere apparent, as in the alternately pugnacious and tender opening movement. In the central movement, meditative and deeply philosophical polyphony encloses a vigorous scherzo section which flows into a capricious episode of strumming pizzicato, a complete contrast in sonority and texture before the slow music returns. The finale, in moderate tempo, contrasts serious and formally grave music, almost like impassioned oratory, with a quieter, more reflective central episode. The music rises to a peak of eloquence just before the laconic close. Instrumentiste aux talents multiples, Paul Hindemith déclara un jour pouvoir jouer toutes les parties de vents, de cuivres, de cordes, de percussion ou de clavier des divers ensembles de concertos de sa Kammermusik op. 36. À l’âge de dix-neuf ans, déjà premier violon de l’orchestre de l’Opéra de Francfort, il avait interprété en public le Concerto pour violon de Beethoven et semblait appelé à devenir violoniste. Mais l’alto était son grand amour; dans les années 1920, il devint un altiste virtuose mondialement renommé, comme membre du Quatuor Amar et comme soliste de concert (il assura par exemple la première du Concerto pour alto de William Walton). L’alto est peut-être l’instrument solo pour lequel il écrivit le plus et le répertoire ainsi créé est plus fourni, plus marquant que celui d’aucun autre compositeur de XXe siècle. Outre un concerto à grande échelle (Der Schwanendreher), deux autres pièces concertantes (la cinquième Kammermusik et la deuxième Konzertmusik) et la Trauermusik pour alto et cordes, il rédigea pas moins de sept sonates, soit pour alto et piano (enregistrées sur le disque Hyperion CDA67721), soit pour alto solo. Hindemith écrivit toutes ces œuvres en vue de les interpréter lui-même. Ses quatre sonates sans accompagnement, parues sur une petite vingtaine d’années, revêtent ainsi une importance particulière—presque un testament personnel, un soliloque intime, comme en offre sa production variée, embrassant plusieurs genres. La sonate pour instrument à cordes sans accompagnement compte parmi les formes instrumentales les plus exigeantes: l’interprète ne doit pas juste projeter une ligne mélodique unique, il doit créer (en fait, surtout suggérer) une harmonie indépendante et un contrepoint sur les cordes isolées. Ce type de sonate était pratiquement tombé en désuétude depuis l’ère baroque et ses chefs-d’œuvre inégalés, les Sonates et partitas pour violon mais aussi les Suites pour violoncelle de J.S. Bach. S’essayer à ce genre jeta une nuance bachienne sur la pensée musicale de Hindemith. Bach, cependant, n’écrivit rien pour l’alto moderne; en réalité, cet instrument, longtemps resté le parent pauvre des cordes, avait rarement été utilisé en solo aux époques classique et romantique, à quelques excentriques exceptions près, tel le Harold en Italie de Berlioz. La promotion que Hindemith en fit, comme interprète et comme compositeur, s’inscrivit dans un mouvement plus large qui, au début du XXe siècle, visa à étoffer le répertoire pour alto, en parallèle avec le travail de l’altiste virtuose Lionel Tertis, en Grande-Bretagne. Rappelons que Hindemith fut parmi les premiers interprètes à défendre les Sonates du Rosaire sans accompagnement de Heinrich Biber, antérieures à celles de Bach. Mais nul doute que, lorsqu’il s’attaqua au genre de la sonate en solo, Hindemith pensait à Max Reger, dont l’influence stylistique marque certaines de ses œuvres de jeunesse. Au début de la Première Guerre mondiale, Reger, alors sur sa fin, fut le premier à adapter le style de cordes bachien au langage harmonique développé de l’époque. Son vaste recueil op. 131—comprenant son deuxième corpus de préludes et fugues pour violon solo, trois suites pour violoncelle solo (enregistrées sur le disque Hyperion CDA67581/2) et, fait significatif, trois suites pour alto solo—parut en 1915, juste quatre ans avant la première sonate pour alto solo de Hindemith. Ce n’est sûrement pas un hasard si la première exécution connue d’une suite pour violoncelle de Reger fut assurée en 1916 par Maurits Frank, professeur du frère d’Hindemith, Rudolf, violoncelliste: en fait, ce fut pour Frank que Hindemith écrivit, cette année-là, son précoce Concerto pour violoncelle en mi bémol majeur op. 3. La première Sonate pour alto solo op. 11 no 5 est la dernière des cinq sonates pour instruments à cordes entreprises par Hindemith en 1918, alors qu’il servait encore dans l’armée allemande, sur le font de l’ouest; il les acheva à son retour à Francfort, au début de l’année suivante, et les publia ensemble sous le numéro d’opus 11. À cette époque, faire d’autant d’œuvres des subdivisions d’un même opus était peu ou prou un geste inédit, attestant une envie de balayer les attitudes romantiques, telle cette idée selon laquelle toute composition était une œuvre d’art complète, totalement distincte. Certes, Brahms et Reger avaient parfois publié des œuvres de chambre par deux ou trois mais, en regroupant autant de pièces de belle taille, Hindemith renoua avec l’exemple de Haydn, ou même de Haendel, offrant aux interprètes un recueil dans lequel piocher. S’il fut prompt à donner la première exécution de la sonate jumelle pour alto et piano (op. 11 no 4), il attendit le 14 novembre 1920 pour créer, lors d’un récital donné à Friedburg, la sonate solo op. 11 no 5—peut-être, fatalement, la plus exigeante du lot—, pourtant esquissée le 21 juillet 1919. L’op. 11 no 5 trahit les influences grâce auxquelles Hindemith continuait de se forger une identité musicale. Brahms, Reger et César Franck sont en filigrane dans le premier mouvement «vif mais pas précipité» (Lebhaft, aber nicht geeilt) et il y a une nuance de Debussy (qu’adorait le commandant du compositeur, au front) dans le mouvement lent rhapsodique. Hindemith demanda à ses nouveaux éditeurs, Schotts Söhne (Mayence), d’en imprimer la section centrale en plus petit, comme une parenthèse évanescente. Le scherzo suivant a, lui aussi, une pointe de fantaisie impressionniste, qui nous rappelle le «Pierrot dans la lune» de la Sonate pour violoncelle de Debussy (1914). Ces trois mouvements sont très courts, mais le finale est un massif mouvement de variation intitulé «dans la forme et le tempo d’une passacaille» (In Form und Zeitmass einer Passacaglia). Le modèle ultime est ici, indéniablement, la célèbre Chaconne en ré mineur de la deuxième partita pour violon de Bach, mais vue à travers un sens postbrahmsien de la sonorité et de l’architecture pour un résultat véritablement contemporain. Prouesse compositionnelle des plus impressionnantes, cet ardent (et ardu) mouvement est le premier exemple d’une forme qui allait être un des sceaux de Hindemith, tout au long de sa carrière, ce qui fait de cette sonate une manière de manifeste artistique. Hindemith présenta sa Sonate pour alto solo op. 25 no 1 lors d’un concert à Cologne le 18 mars 1922. Depuis sa sonate précédente, en 1919, il était devenu le chef de file des jeunes compositeurs d’Allemagne, avait été un court moment un enfant terrible de l’expressionnisme et était apparu—avec sa série de Kammermusik—comme le fer de lance d’une tendance néo-baroque, très néo-classique, moins soucieuse de beauté et d’éloquence que d’efficacité et de vigueur dans la présentation de pures idées musicales: la «Nouvelle objectivité» (Neue Sachlichkeit). Cette tendance transparaît d’emblée dans l’op. 25 no 1, qui s’ouvre sur un mouvement où une agressive séquence en accords s’oppose à un matériel plus implorant, pour passer rapidement à un mouvement plus rapide «très frais et tendu» (Sehr frisch und straff). Le relâchement esthétique vient des deux mouvements lents lyriques, assez substantiels et musicalement connexes—surtout celui, émouvant et élégiaque, qui clôt l’œuvre. Mais entre eux, il y a le quatrième mouvement, un débordement furieux marqué d’un extraordinaire «Tempo rageur, la beauté sonore déchaînée est secondaire» (Rasendes Zeitmass. Wild. Tonschönheit ist Nebensache). À partir d’un bourdonnement initial de frelon (ut grave répété), ce mouvement est entièrement fait de noires jouées à un tempo fou mais organisées en fonction de signes de la mesure sans cesse changeants: un scherzo de l’ère de la machine, vraiment. Un an plus tard, la Sonate pour alto solo op. 31 no 4, composée en 1923 mais jouée seulement l’année suivante, confirma l’austérité du nouveau style de Hindemith, tout en présageant un regain de liberté. Le premier des trois mouvements est une remarquable épreuve de virtuosité, en façon de vigoureux moto perpetuo, avec des traits d’esprit et des rythmes de danse folkloriques obsessionnels, martelés. Le mouvement lent, intitulé «Lied», est à la manière d’une chanson: un gracieux et complexe interlude lyrique. Comme l’op. 11 no 5, cette sonate s’achève sur un finale massif, plus long que tous les autres mouvements réunis. C’est une série de variations sur un thème assez rustique, voire quasi médiéval, lancé par l’alto. La séquence de variations se partage en trois grands volets, d’abord de plus en plus virtuoses, puis lents et secrètement expressifs pour finalement atteindre une conclusion fervente, grandiloquente. Hindemith donna la première de cette œuvre à Donaueschingen le 18 mai 1924. Lorsqu’il composa sa dernière Sonate pour alto solo, en avril 1937, Hindemith, pratiquement condamné à l’exil par les nazis, menait une vie de compositeur-interprète itinérant, même s’il n’avait pas encore résolu de quitter l’Allemagne pour de bon—il le fera l’année suivante. Cette sonate fut écrite à la va-vite dans le train New York–Chicago puis terminée le 21 avril, jour de sa création au Chicago Arts Club. La langue de Hindemith est devenue plus chaleureusement émotionnelle—voire elle est redevenue romantique—et, par contraste avec le chromatisme des deux autres sonates, elle met l’accent sur des intervalles parfaits, éclatants, surtout la quarte et la quinte. Bien que composée dans une période d’angoisse, cette sonate est la plus directe et la plus lyrique de la série, et ses trois mouvements (avec des insinuations centrales de quarte et de quinte) offrent le schéma formel le plus équilibré. Reste qu’une certaine virtuosité enracinée dans une profonde connaissance de l’instrument est partout flagrante—ainsi dans le mouvement d’ouverture, tout à tour pugnace et tendre. Dans le mouvement central, une polyphonie méditative et profondément philosophique enclôt un vigoureux scherzo, qui s’écoule dans un capricieux épisode de pizzicatos raclants, un total contraste de sonorité et de texture avant le retour de la musique lente. Le finale, dans un tempo modéré, oppose une musique sérieuse, formellement grave—presque un discours fervent—à un épisode central plus paisible, plus réfléchi. La musique atteint à un summum d’éloquence, juste avant la conclusion laconique. Paul Hindemith war ein vielseitiger Instrumentalist. Er behauptete einmal, dass er alle Holz-, Blech-, Streicher-, Schlagzeug- und Klavierstimmen seiner verschiedenen Kammermusik-Konzerte op. 36 spielen konnte. Im Alter von 19 Jahren war er bereits Konzertmeister des Frankfurter Opernorchesters, hatte Beethovens Violinkonzert öffentlich aufgeführt und schien für eine Karriere als Geiger bestimmt. Aber seine große Liebe gehörte der Bratsche, und in den 1920er Jahren wurde er als Virtuose auf diesem Instrument berühmt—als Bratscher des Amar-Streichquartetts sowie als Konzertsolist (er spielte z. B. die Uraufführung von William Waltons Bratschenkonzert). Er schrieb womöglich mehr Solorepertoire für die Bratsche als alle anderen Instrumente, und seine Werke für dieses Instrument sind wohl zahlreicher und bedeutender als die aller anderen Komponisten des 20. Jahrhunderts. Abgesehen von einem großen Konzert (Der Schwanendreher), zwei weiteren konzerthaften Stücken (die fünfte Kammermusik und die zweite Konzertmusik) und der Trauermusik für Bratsche und Streicher komponierte er nicht weniger als sieben Sonaten entweder für Bratsche und Klavier (auf Hyperion CDA67721 eingespielt) oder unbegleitete Bratsche. Hindemith schrieb all diese Werke zum eigenen Gebrauch. Die vier unbegleiteten Sonaten, die über einen Zeitraum von nahezu 20 Jahren erschienen, sind daher von besonderer Bedeutung und kommen in seinem facettenreichen und genreüberspannenden Œuvre einem persönlichen Zeugnis oder einem intimen Selbstgespräch am nächsten. Die unbegleitete Streichersonate ist eine der anspruchsvollsten Instrumentalformen: der Spieler muss nicht nur eine einzelne Melodieline projizieren, sondern selbständige Harmonik und Kontrapunkt auch auf den verschiedenen Saiten kreieren (oder meist eigentlich implizieren). Das Genre der Solostreichersonate war seit dem Barock mit den unübertroffenen Meisterwerken der Form in Joh. Seb. Bachs Sonaten und Partiten für Violine und Suiten für Cello praktisch aus dem Gebrauch gekommen. Allein der Versuch, das Genre der Solosonate wiederzubeleben, verlieh Hindemiths musikalischem Denken einen Anklang von Bach. Bach schrieb aber nichts für die moderne Bratsche. Das Instrument blieb lange das Aschenbrödel der Streicher und wurde in der klassischen und romantischen Periode mit Ausnahme exzentrischer Werke wie Berlioz’ Harold in Italien selten als Soloinstrument eingesetzt. Als Verfechter der Bratsche als Spieler und Komponist gehörte Hindemith einer größeren Bewegung am Anfang des 20. Jahrhunderts an, die im Einklang mit dem Virtuosen Lionel Tertis in Großbritannien bemüht war, das Repertoire der Bratsche zu erweitern. Man sollte auch beachten, dass Hindemith einer der ersten Interpreten war, die sich für die unbegleiteten Mysteriensonaten (oder Rosenkranzsonaten) von Heinrich Biber einsetzten, die früher entstanden als Bachs. Es besteht jedoch kein Zweifel daran, dass Hindemith in seinen ersten Versuchen im Genre der unbegleiteten Sonate Reger als Vorbild im Sinne hatte, dessen stilistischer Einfluss in einigen seiner frühen Werke spürbar ist. Reger leistete gegen Ende seines Lebens, in den Anfangsjahren des Ersten Weltkrieges, Pionierarbeit für die Adaption von Bachs Instrumentalstil für Streicher für die erweiterte harmonische Sprache vom Anfang des 20. Jahrhunderts. Regers enorme Sammlung op. 131, die sein zweites Heft von Präludien und Fugen für Solovioline, drei Suiten für Solocello (auf Hyperion CDA67581/2) und besonders die drei Suiten für Solobratsche enthält, erschien 1915, nur vier Jahre bevor Hindemith 1919 seine erste Sonate für Solobratsche produzierte. Es ist bestimmt kein Zufall, dass die erste bekannte Aufführung einer Cellosuite von Reger 1916 von Maurits Frank gegeben wurde, der Hindemiths cellospielenden Bruder Rudolf unterrichtete, und für den Hindemith sogar im gleichen Jahr sein frühes Es-Dur-Cellokonzert op. 3 schrieb. Seine erste Sonate für Bratsche allein op. 11 Nr. 5 ist die letzte der fünf Streichersonaten, die Hindemith 1918 begann, als er noch mit der deutschen Armee an der Westfront diente, und die er Anfang 1919 nach seiner Heimkehr nach Frankfurt fertigstellte und zusammen als sein op. 11 veröffentlichte. Damals war es praktisch unerhört, so viele Werke als Untergruppen eines einzelnen Opus zusammenzustellen, was Hindemiths Bestreben andeutete, solche romantische Vorstellungen wie die Idee, dass jede Komposition ein in sich geschlossenes, völlig eigenständiges Kunstwerk darstellt, zu überwinden. Brahms und Reger hatten zwar manchmal schon zwei oder drei Kammermusikwerke zusammen veröffentlicht, aber Reger kehrte zum Beispiel Haydns oder sogar Händels zurück, indem er eine solche Anzahl umfangreicher Werke zusammenfasste, und liefert eine Sammlung, die dem Interpreten eine Wahl gibt. Die benachbarte Sonate (op. 11 Nr. 4) für Bratsche und Klavier führte er schnell auf, spielte aber die Uraufführung der—wohl unvermeidbar anspruchsvollsten—Solosonate op. 11 Nr. 5 erst am 14. November 1920 in einem Recital in Friedburg obwohl sie schon am 21. Juli 1919 skizziert wurde. Op. 11 Nr. 5 reflektiert einige der Einflüsse, die Hindemith noch immer halfen, seine persönliche musikalische Identität zu formen. Im ersten Satz, Lebhaft, aber nicht geeilt, wird auf Brahms, Reger und César Franck angespielt, und der rhapsodische langsame Satz besitzt einen Anklang an Debussy (den Hindemiths befehlshabender Offizier an der Front sehr liebte). Hindemith unterwies seinen neuen Verleger, Schotts Söhne in Mainz, den Mittelabschnitt dieses Satzes kleiner zu drucken, sozusagen nahezu unmerklich in Klammern. Das folgende Scherzo enthält einen Hauch von impressionistischer Phantasie, die an die Schilderung des „mondsüchtigen Pierrot“ in Debussys Cellosonate von 1914 erinnert. Diese drei Sätze sind alle recht kurz, aber das Finale ist ein massiver Variationssatz mit der Anweisung In Form und Zeitmass einer Passacaglia. Hindemiths letztendliches Vorbild ist unverkennbar die berühmte d-Moll-Chaconne aus Bachs zweiter Violinpartita, im Spiegel eines brahmsischen Gespürs für Klang und Architektur betrachtet, bekommen wir aber ein wahrhaft zeitgenössisches Resultat. Dieser feurige (und schwierige) Satz ist eine äußerst eindrucksvolle kompositorische Leistung und das erste Beispiel einer Form, die seine ganze Laufbahn hindurch ein Markenzeichen Hindemiths bleiben sollte, wodurch diese Sonate einer Art persönliches Manifest seiner künstlerischen Ambitionen wird. Hindemith stellte seine nächste Sonate für Bratsche allein, op. 25 Nr. 1, am 18. März 1922 in einem Konzert in Köln vor. Seit 1919 hatte er als Deutschlands führender junger Komponist Prominenz gewonnen, hatte eine kurze Phase als expressionistisches Enfant terrible durchlebt und war mit seiner Kammermusik-Serie als Anführer einer neobarocken Richtung hervorgetreten: ein eifriger Neoklassiker, weniger um Schönheit und Eloquenz bemüht als um die rationelle, dynamische Vorstellung reiner musikalischer Gedanken, der sogenannten Neuen Sachlichkeit. Diese Tendenz zeigt sich unmittelbar in op. 25 Nr. 1; das Werk beginnt mit einem Kopfsatz, in dem einer aggressiven Akkordsequenz Material von inständigerem Charakter entgegengesetzt wird, geht aber bald in einen schnelleren Satz (Sehr frisch und straff) über. Die beiden expansiveren und musikalisch aufeinander bezogenen langsamen Sätze bieten ästhetische Erleichterung—besonders der rührend-elegische, mit dem die Sonate schließt. Aber zwischen ihnen folgt der vierte Satz, ein furioser Ausbruch mit der außerordentlichen Anweisung Rasendes Zeitmass. Wild. Tonschönheit ist Nebensache. Gleich vom anfänglichen Hornissengeschwirr eines repetierten tiefen C besteht dieser Satz ausschließlich aus einzelnen Vierteln, die in halsbrecherischem Tempo gespielt werden, aber in stetig wechselnden Zeitmass organisiert werden: ein wahres Scherzo des Maschinenzeitalters. Ein Jahr später bestätigte Hindemiths 1923 komponierte, aber erst im folgenden Jahr uraufgeführte Sonate für Bratsche solo, op. 31 Nr. 4 die Strenge dieses neuen Stils, weist aber schon auf größere Freiheit voraus. Der erste der drei Sätze ist eine bemerkenswerte Virtuositätsprobe im Stil eines lebhaften Moto perpetuo mit gelegentlichen Geistesblitzen und stampfenden, besessenen Tanzrhythmen. Der langsame Satz mit der Überschrift „Lied“ ist ein anmutiges, intrikat-lyrisches Zwischenspiel. Wie op. 11 Nr. 5 endet auch diese Sonate mit einem gewaltigen Finale, das so lange dauert wie die übrigen Sätze zusammen. Es ist ein Variationensatz über ein rustikales, quasi mittelalterliches Thema, das die Bratsche am Anfang vorstellt. Die Abfolge der Variationen fällt in drei große Abschnitte, zuerst zunehmend virtuos, dann langsam und innig-expressiv und steigert sich schließlich in einen seriösen, grandiosen Abschluss. Hindemith spielte die Uraufführung dieser Sonate am 18. Mai 1924 in Donaueschingen. Im April 1937, als Hindemith seine letzte Sonate für Bratsche solo schrieb, lebte er als fahrender Musiker und Komponist und war, obwohl er noch nicht ganz den Entschluss gefasst hatte, Deutschland endgültig zu verlassen—das sollte ein Jahr später folgen—praktisch schon von den Nazis ins Exil getrieben worden. Die Sonate wurde im Zug von New York nach Chicago schnell skizziert, am 21. April fertiggestellt und am gleichen Tag von Hindemith im Chicago Arts Club uraufgeführt. Seine Musiksprache war unterdessen wärmer, nahezu wieder romantisch geworden, und im Kontrast zur Chromatik der beiden vorhergehenden Sonaten liegt der Schwerpunkt hier auf hellen, reinen Intervallen, besonders der Quarte und Quinte. Trotz der bangen Zeit, in der sie komponiert wurde, ist diese Sonate die direkteste und lyrischste der ganzen Serie, und ihre drei Sätze (mit Andeutungen eines vierten und fünften im Mittelsatz) liefern die ausgewogenste Formanlage. Dennoch ist überall—wie etwa im abwechselnd vehementen und zarten ersten Satz—eine in Hindemiths gründlicher Kenntnis des Instruments verwurzelte Virtuosität präsent. Im Mittelsatz umrahmt meditative, tief-philosophische Polyphonie einen energischen Scherzoabschnitt, der in eine kapriziöse Episode mit klimpernden Pizzikatos überfließt—ein totaler Kontrast in Klang und Textur vor der Wiederkehr der langsamen Musik. Das Finale in mäßigem Tempo, kontrastiert seriöse, förmlich-gravitätische, nahezu leidenschaftlich-rhetorische Musik mit einem ruhigeren, besinnlicheren Mittelabschnitt. Die Musik steigert sich zu einem eloquenten Höhepunkt bevor sie lakonisch schließt.